It was winter, and I had entered a community contest for Deviantart in 2009. The contest asked participants to illustrate a wish for winter. I chose to illustrate the massive attention from the earthquake in Haiti. I was inspired with the idea; it doesn’t snow in Haiti. I felt it was likable- something a Haitian child would wish for as he saw and heard of stories of how it snows in winter. I decided that this may be a great fantasy. I was conflicted with the idea from the News tragic footages of Haitian outcries. They’re display of disturbances and pleas for help from Haitians in their catastrophic turmoil. 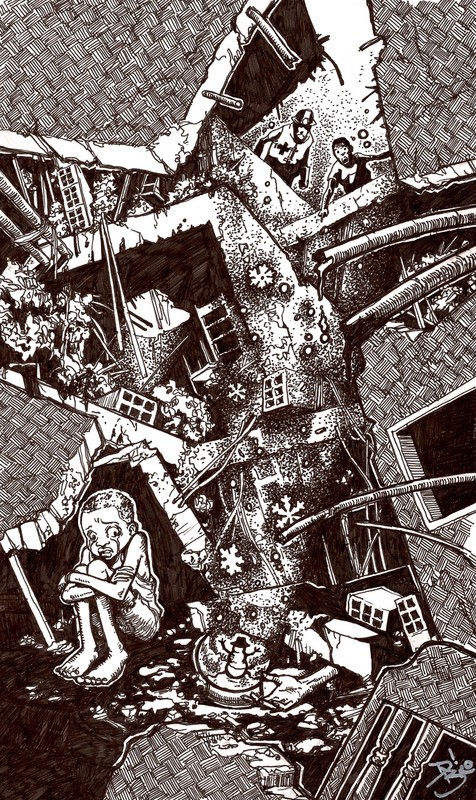 I knew the task of illustrating this wish would be dark, emotional, and claustrophobic. The composition is broken in segments. I demolished the foreground as a compositional border for the viewer. I chose to use the center of the piece as a narration for the viewer to see the trickling dust falling toward the globe. I intended the metaphor to lash itself to the viewers’ mind in the background. This Winter Help Came. I accepted their harsh reality and ensued to illustrate this child’s wish for snow as a symbolism for hope.